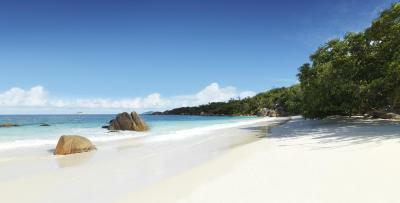 Lock in a great price for Raffles Seychelles – rated 9.2 by recent guests! This hotel is beyond amazing, if I could give them more than five stars I would. They surprised me with a birthday cake and card which was very special to me. 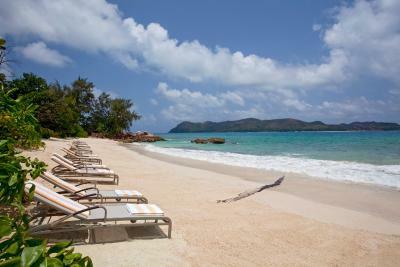 They have the best beach view from most hotels in praslin and have private pools for each and every room in the resort. 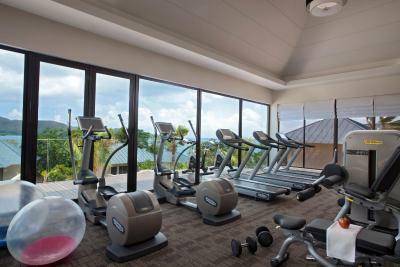 The prices are all mindful and the room itself is very very big and spacious which was great. I would like to thank all the staff for being very kind and helpful more than any other hotel I’ve been to, everyone was so nice and never refused to help us when we needed it. We even made some friends at the hotel which was awesome. 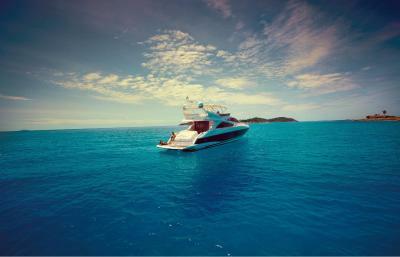 I would definitely recommend for each and everyone staying in praslin in the future. This place deserves more than any stars you could give it. Omg, no words to describe how amazing this hotel was, all staff very friendly and helpful, made us feel like a priority, cooked my favorite meal that was not even on Menu, also gave us late check out, so I could rest properly, they are always professional, fast service, and the price is totally fair, I loved our villa, thank you guys! The best location, view, staff and experience ever. If you haven’t been, just book it now!! Amazing. Staff really mate the whole experience superb. The views are so good from the panoramic view villas that you will find yourself canceling activities just to sit on your balcony and embrace it. It’s gorgeous. From the hotel lobby to the rooms it’s exceptional. Food is great. Spa facilities are great. Our villa was so incredible with an excellent view of ocean and mountains. Plunge pool with arge sitting area was amazing. Food at every restaurant was incredible. Staff was amazing. So kind and attentive. Perfect place to stay! What's not to love here? This property is perfect. The staff is as good as it gets. We were looked after from the minute we arrived. 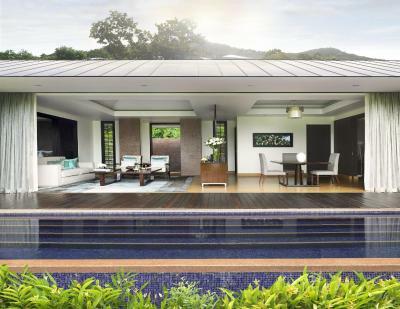 Design of villa was excellent, with delightful panoramic view. Concierge service was very helpful. I do not tend to write reviews, however, having just got back from the Seychelles and Raffles specifically, the few words I can, wow, wow, and wow. The hotel itself is beautiful, open, the beaches are incredible, the food was excellent, and the staff were the icing on the cake. I travelled with my two young daughters, the amount of care that went into our stay was something I have never seen before, down to providing sterilising machine and baby bath when I arrived (even though I didn't ask for one), to providing treats for the girls every other evening, chocolate, cake, again without asking, even to when we asked for a plaster for our daughter, which at the time they didn't have in the shop, when we arrived back in the evening, there was an envelope with two plasters in - amazing. That is the best was I can describe my stay at Raffles, people cared - which is the highest compliment I can give, that is a extreme rarity. Without doubt, I will be back! Staffs were very kind and very helpful. I really liked the restaurants in the hotel, especially the ones which served indian and local foods. Amazing resort in a great area. 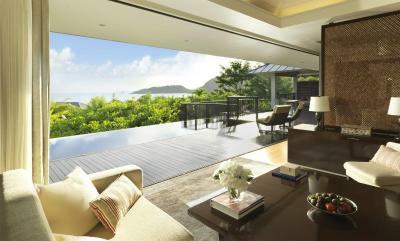 Villas with breathtaking views are planned sparsely for extra privacy and quiet. Great restaurants and breakfast. Very nice, welcoming, and attentive staff. The resort manager, Salwa, was very kind and granted us a late check-out which no other resort will do without an extra charge. 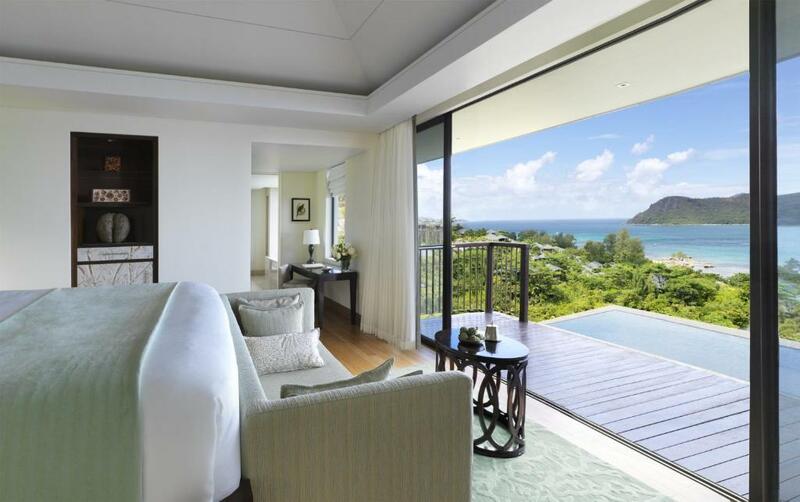 Raffles Seychelles This rating is a reflection of how the property compares to the industry standard when it comes to price, facilities and services available. It's based on a self-evaluation by the property. Use this rating to help choose your stay! One of our top picks in Baie Sainte Anne.Closely located to one the world’s most beautiful beaches – Anse Lazio, Raffles Seychelles offers luxurious villas on the island of Praslin, easily accessible via a 15-minute flight from Mahe International Airport. 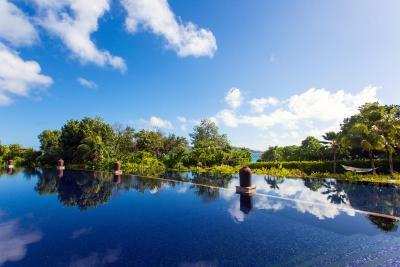 It offers private plunge pools and 2 infinity pools. Each with free WiFi access, the modern villas have open-air balconies overlooking the garden, the ocean, or the surrounding area. The spacious, air-conditioned villas have a flat-screen TV with cable channels, and also come with a mini-bar and a Nespresso coffee machine. Facilities offered include a beauty salon, the Sugar Palm Kid’s Club, and 6 restaurants and lounges from fresh Mediterranean cuisine at Losean restaurant, a rooftop terrace and shisha lounge to private dinners on the beach. 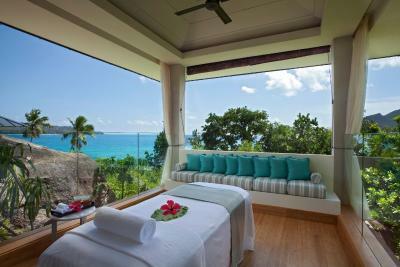 Raffles Spa features private outdoor treatment rooms overlooking the serene blue ocean and tropical landscape. The resort is located close to the Vallee de Mai, a UNESCO World Heritage site, and is also a 15-minute ferry ride away from Curieuse Island, home to 500 giant tortoise and La Digue, famous for its secluded beaches, diving and snorkeling. This property also has one of the top-rated locations in Baie Sainte Anne! Guests are happier about it compared to other properties in the area. 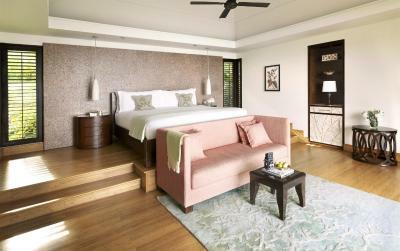 When would you like to stay at Raffles Seychelles? The villa has a balcony with view of the surrounding hillside. There is a sitting area with sofa and a flat-screen TV. The private bathroom has free toiletries and slippers. 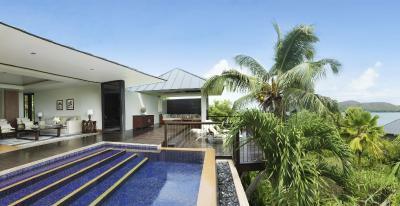 Hillside villas also features a private plunge pool and outdoor rain shower. Located in the center of the resort, these villas feature a spacious living area, outdoor pavilion and plunge pool with breathtaking views over the Indian Ocean. 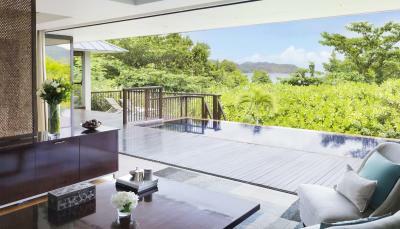 The villa has a balcony with a panoramic view of the outer lying islands and the Indian Ocean. There is a sitting area with sofa and a flat-screen TV. The private bathroom has free toiletries and slippers. 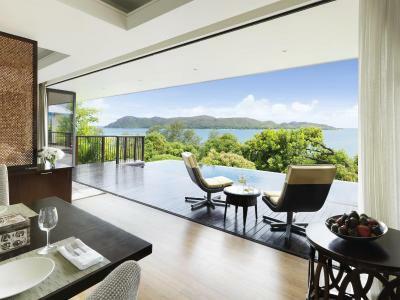 This villa has a balcony, sofa and air conditioning. 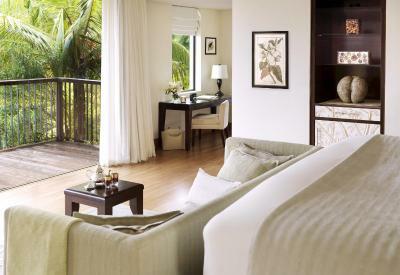 The largest villas at the resort, these units offer a spacious living area and 2 bedrooms with attached bathroom. 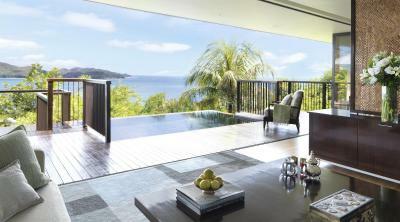 There is also an outdoor pavilion with panoramic ocean views, plunge pool and private barbecue setup. 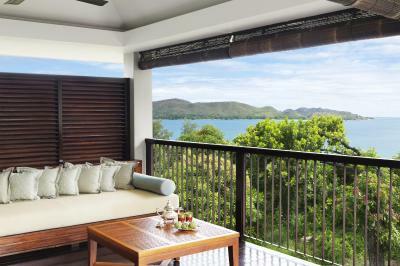 This villa has a balcony, air conditioning and DVD player. 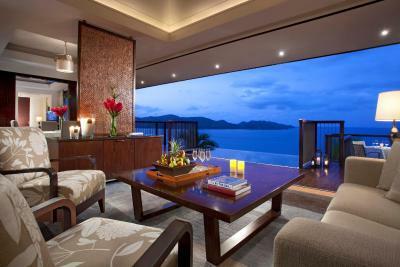 This villa has a balcony, mini-bar and bathrobe. - 86 luxury pool villas, among the most spacious villas in the Seychelles, with large outdoor pavilions and outdoor rain shower. - One & Two Bedroom Villas come with complimentary, 24-hour signature Raffles Butler service, catering to guests' every need - A wide variety of dining options including Indian Ocean cuisine, casual dining, Asian, sushi and sashimi - Home to the first Raffles Spa, with 13 indoor and outdoor treatment pavilions and signature black pearl treatments - The Sugar Palm Kids' Club caters to toddlers, children and teenagers with an exciting daily program of fun activities. 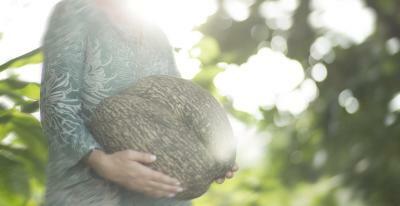 House Rules Raffles Seychelles takes special requests – add in the next step! Raffles Seychelles accepts these cards and reserves the right to temporarily hold an amount prior to arrival. The charges below are not included in the overall room rate. The compulsory New Year's Eve Gala Dinner on 31 December 2018 costs EUR 200 per adult, EUR 95 per child between 6-12 years old and is free of charge for children under the age of 5. Please inform Raffles Seychelles of your expected arrival time in advance. You can use the Special Requests box when booking, or contact the property directly using the contact details in your confirmation. Please note that the full amount of the reservation is due before arrival. Raffles will send a confirmation with detailed payment information. After full payment is taken, the property's details, including the address and where to pick up the keys, will be sent to you by email. General level of service was a little rude and fairly incompetent - this could have been caused possibly by the Easter weekend - however if they are going to charge increased rates for this period then they should insure they maintain a high level of service from the staff. 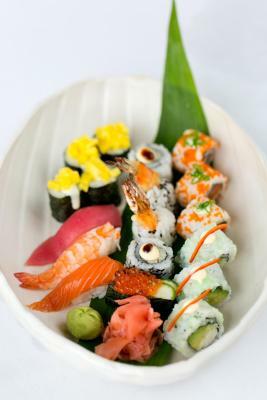 Food was generally on the disappointing side and sushi offering was laughable. Taking a buggy everywhere due to the nature of the Island, guess that's Seychelles on a whole, but buggies where at our room within 5 minutes every-time on time. Beach beds were not enough, and a shower is necessary in the beach. Food could have been better at times but that’s just me being picky. Nothing. But if all restaurants can open everyday, will be better. We can have more choice. Service in general has space for improvements. Beach is the key. It should be exceptional, but now unfortunately there are number of issues: sunbeds and umbrellas providing, a lot of boats in swimming area etc. Very expensive hotel. Hotel activities and excursions are way overpriced and would cost you doubles than what you would find outside the resort. Nothing worth mentioning. Our stay was perfect. The only minor niggle is everything is very expensive but nevertheless worth it. 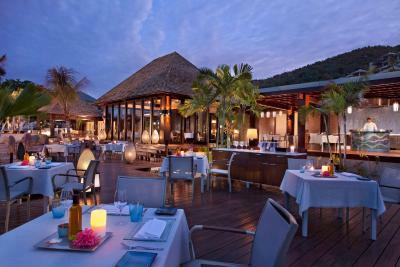 There isn’t anything to not like about Raffles, Praslin. A divine place where you have to accept that you get what you pay for. Wonderful hotel. It was my honeymoon and Raffles made many surprises, like an upgrade in the room, bath with champagne... Furthermore, the room is excellent: great view, confortable, with private pool and huge. The breakfast had many options as well and both restaurants at the hotel were very good: one with local food and the other with asian food. The hotel facilities are amazing (pool and bar service, paddle at the beach, etc) and all the employees were very kind. 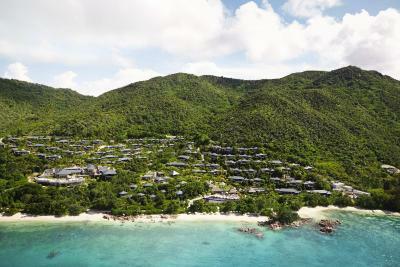 It is by far the best hotel in Praslin.